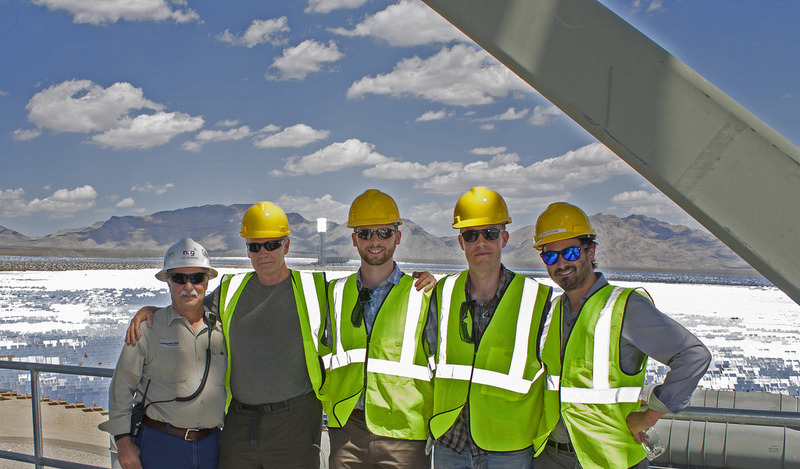 On July 22nd, four of us from GPI visited a concentrated solar power (CSP) facility, the only one of its kind in North America, located near the Mojave Desert in Ivanpah, California. 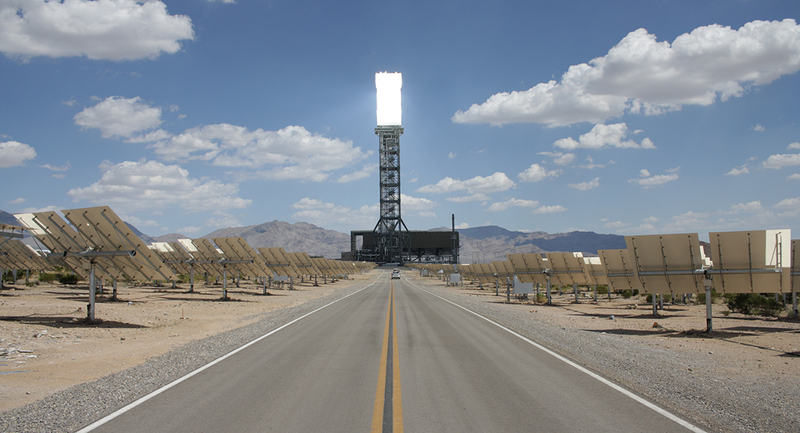 The Ivanpah facility is operated by NRG Energy and has been producing electricity since January, 2014, through a 5 mile wide network of mirrors that concentrate sunlight onto three 450 foot tall towers. Over 350 thousand mirrors are arranged in pairs around three circular networks that surround each tower unit, and each pair of mirrors is tracked through a GPS and fiber optic network that allows centralized control to tilt and point the reflected sunlight with high accuracy onto the tower. 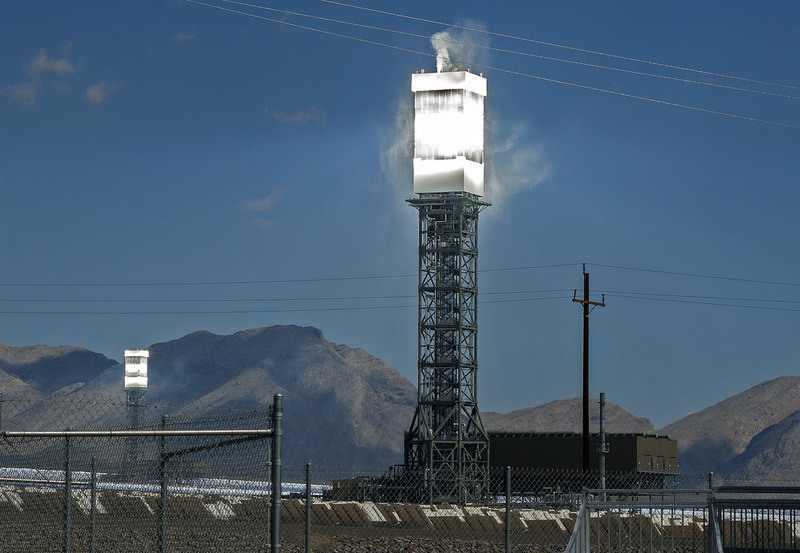 The concentrated sunlight heats water steam in the tower to up to 3,000° Farenheit and 2,500 pounds of pressure to push large 126 – 133 megawatt (MW) generator turbines. For comparison, the surface of the sun is estimated to be about 9,000°F! At full capacity, the three towers produce about 392 MW of zero carbon electricity. 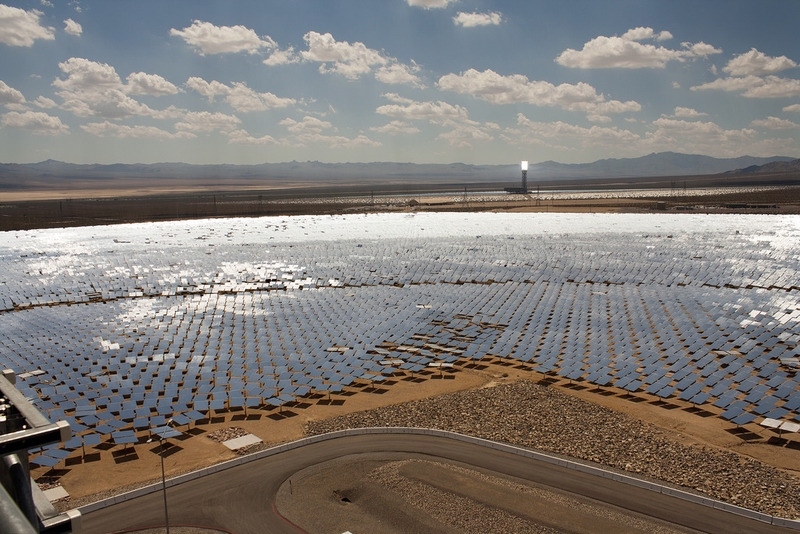 The Ivanpah facility was built on 3,500 acres of desert land that is owned by the US Bureau of Land Management (BLM). Through its 30 year agreement with BLM, NRG maintains a strict practice of wildlife management and conservation to protect a variety of species that make their home in and around the concentrating mirrors. Kit foxes and kangaroo rats are common, as are Mojave green rattlesnakes, which have the most potent venom in North America. All of these species require caution for both their protection and the safety of facility workers, but it is the desert tortoise that demands by far the most care due to its status as a protected species. Due to these concerns, the Ivanpah facility employs up to 50 biologists onsite to manage wildlife. 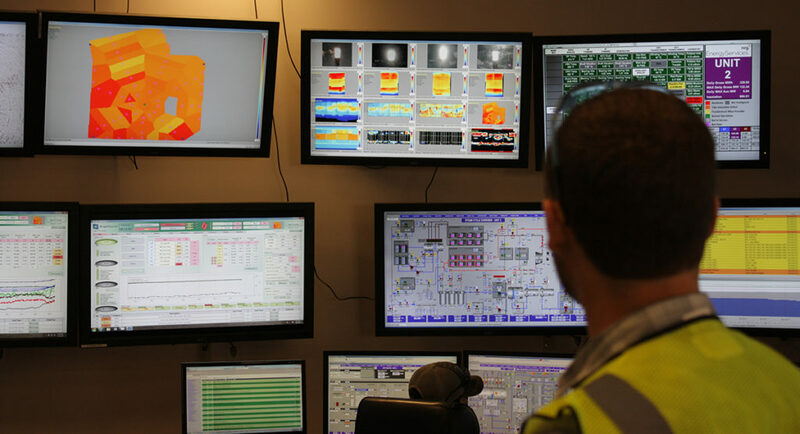 Among natural phenomena, facility staff told us that higher than average wind speeds and “puffy clouds” are the biggest obstacles to full production. Very strong winds have the potential to shatter the mirrors, especially those on the outer edges of the field. Due to their sharp contrasting shadows, low-lying cumulous clouds can darken large portions of the solar mirror networks, resulting in a sharp drop in temperature on the tower. Standby mirrors can be rotated to compensate for partial cloud cover, but each individual tower unit can often go offline at numerous moments throughout a coudy day. 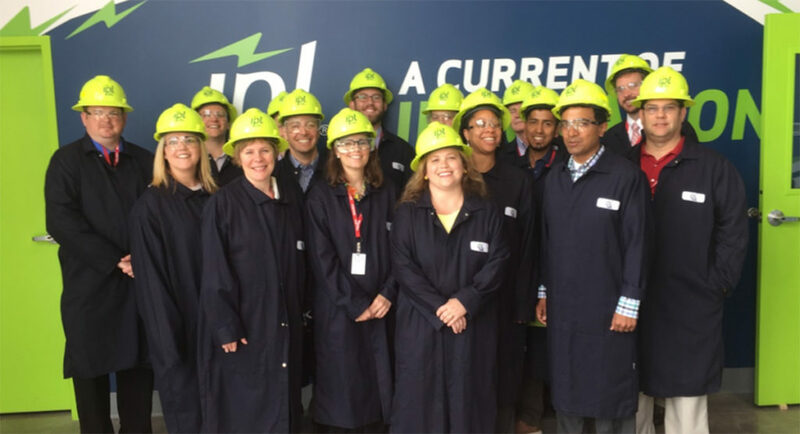 Facility staff informed us that the installation of utility-scale energy storage could help offset this loss of production, and that future sites similar to Ivanpah would find great advantage in including energy storage from day one. 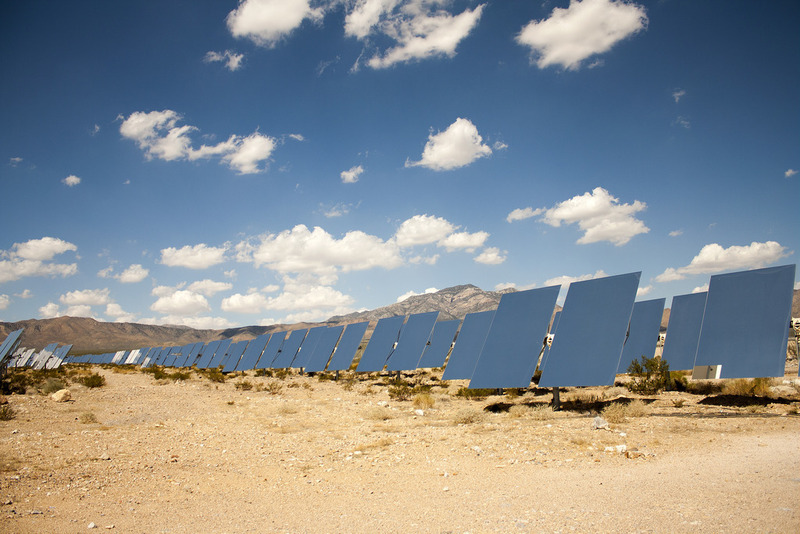 Despite the reliability concerns caused by partly cloudy days, Ivanpah’s power purchasing agreement (PPA) in California requires the grid to take its power without penalties for being off forecasted production levels. 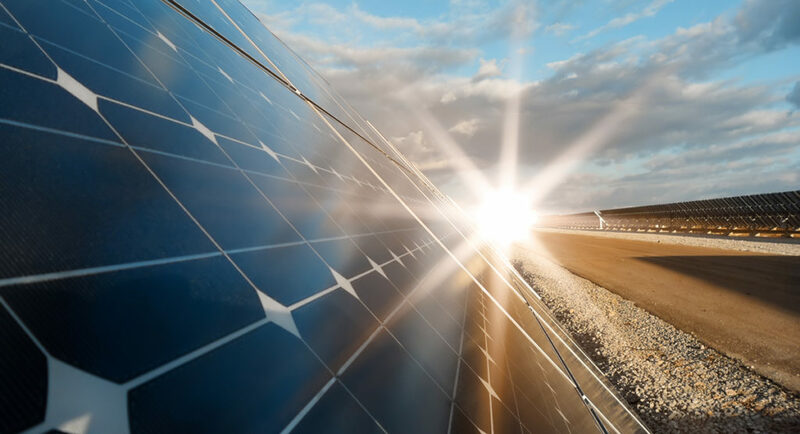 California has a goal to generate 33% of its electricity from renewable energy by 2020, and flexible PPAs for renewable facilities like Ivanpah can balance out economic issues to help meet this goal. Two utilities, Southern California Edison (SCE) and Pacific Gas and Electric (PG&E), buy power from Ivanpah, which is owned by NRG Energy, BrightSource, and Google. One drawback to being unique is that Ivanpah does not have any peer facilities or companies in North America with which it can form a technical working group or develop industry-wide staff training programs. A similar facility is currently being constructed nearby in Tonopah, Nevada, which will have 700 foot tall towers and will hopefully be able to use much of the knowledge gained at Ivanpah to produce carbon free electricity even more efficiently and reliably. The Ivanpah CSP facility was very cool to see and was definitely a highlight of GPI’s Renewable Energy and Storage tour. Brendan, Mike, Steve and I would like to thank NRG’s Ivanpah facility staff for a very fun and informative tour.